Reminds me of the line from the movie Auntie Mame when the old-timers remarked ‘she has a good seat’ referring of course to her riding posture. Speaking from experience, the proper posture for riding a Belgian is ‘ready to bail’. The trip down is long enough to think about how much it is going to hurt, but not quite long enough to to find a way to save yourself. I never rode enough to get thrown from a horse, but I have friends who’ve had horses (well, mostly ponies) their whole lives and have been knocked off, and it never sounds fun. 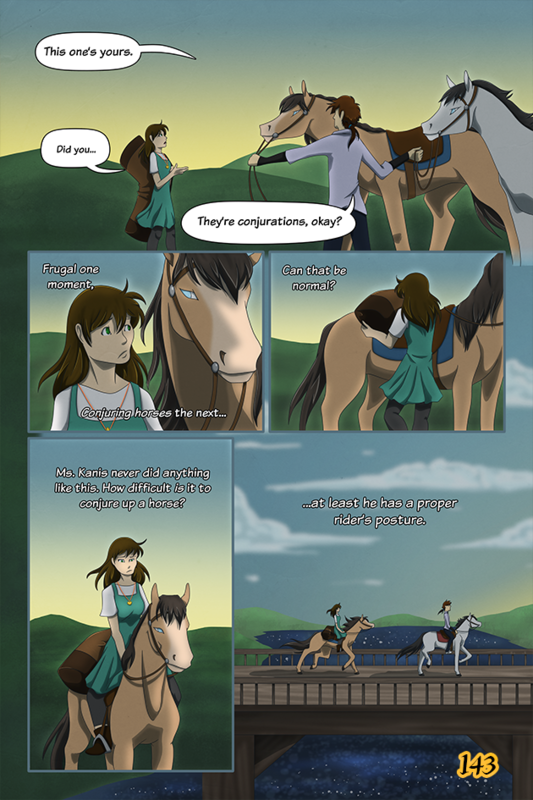 I can’t imagine it’s any more fun falling from a ~17hh tank 😛 As for Thalissa commenting on Shadow’s riding posture… Honestly, it first came up because I needed one last line for this page, haha. It occurred to me that one of her jobs was straight-up caring for horses, so she should know how to ride correctly. If there’s one thing I remember from my lessons, it’s sit up straight, and for the love of all that is holy, keep those heels down!